I have recently returned from Dallas where I was fit with Laserfit wavefront scleral lenses. They are, without a doubt, the best contact lenses I have ever had! The vision is amazing, its High Definition compared to anything else I have ever tried and the comfort is amazing. I have tried a lot of contact lens and visited numerous optometrists in different countries, nothing comes close to the Laserfit lenses. My optometrist has never seen anything like the results I got from Laserfit lenses. 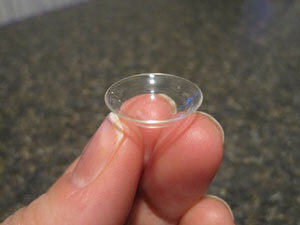 I have tried scleral/semi scleral lenses in the past but these are nothing like them. The whole fitting process is somewhat future like, I imagine in 10-15 years it will be the standard. It’s all computerized. There are no time consuming and excruciating trial lens fittings to endure instead the eyes are scanned with an OCT machine, that process takes about twenty minutes. The data from the machine is then turned into a 3D digital mold of the cornea and from there the contact lenses are designed specifically to fit the cornea. Once that lenses have been made then it’s onto the optics part of the process which involves the standard eyechart plus another machine called a wavefront aberrometer. The wavefront aberrometer can see what you see, it can even generate a picture of what you see on the eyechart! The data from the wavefront machine is then incorporated into the contact lens(this is why the vision is so much better than with a normal contact lenses). Being interested in the whole process I got a chance to see the CAD software that is used behind the scenes to make the lenses, it’s amazingly sophisticated. The whole process is so different to a normal contact lens fitting. Something that has really stuck with me. While I was there I met another KC patient who had exhausted all the conventional avenues there was nothing more that could be done for him and his ophthalmologist had said he needed to have a cornea transplant. It was his second day at the clinic and he was able to see 20/15 with the Laserfit lens! Dr. G. is incredibly committed to ensuring success for the patient. His staff told me he works late into the night tweaking the designs of the lenses. With me he also found binocular vision difficulties, which had been over looked by other optometrists I had visited and had made life pretty difficult. This is a topic for a whole different post! Laserfit Wavefront Scleral Contacts Lenses dramatically improved my vision, lens comfort and wear time. This is the best I have seen since being diagnosed with keratoconus.